As many of you know, some of the research being conducted at Georgica Pond is pretty high tech work. Under the leadership of Dr. Christopher Gobler, we’re bringing together the newest technology and brightest minds to address the threats facing the pond. Two devices work 24 / 7 at the pond taking measurements to help us better understand what exactly is happening. We’d like you to meet both of them. Back in late 2008, I noticed on the USGS web site that they had discontinued the real-time data collection on the pond because of budget cuts. Many of my pond neighbors found the data very useful for a variety of reasons, and I had grown accustomed to going on the web and checking the pond levels on a regular basis. I contacted the USGS, and for a number of years Kevin Mulvey and I funded part or all of the cost of continuing the USGS monitoring. We were happy to do it. The way it works is that a siphon gauge rises and falls with the level of the pond. The gauge is connected to a recording and transmitting device which is powered by a solar panel. The data is recorded locally, and is also transmitted via satellite to the USGS. 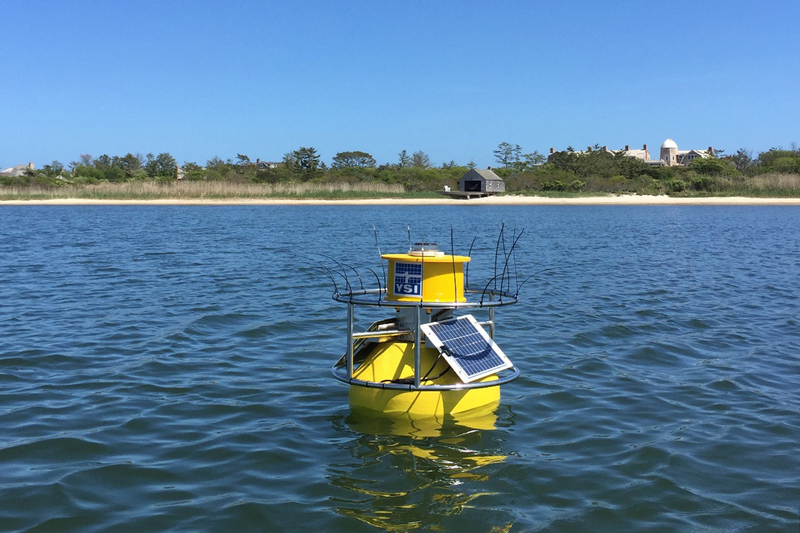 The Village of East Hampton and the USGS have just renewed a 3-year agreement to maintain the monitoring device. This project was funded by the USGS, the Village of East Hampton and FOGP. 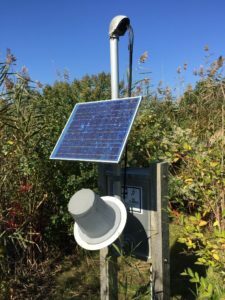 Continuous monitoring at this station will not only supply the needed information for future studies, but will provide the long-term benchmarks against which future hydrologic changes can be compared. This device allows us to resolve trends in water quality on multiple time scales. For example, we have discovered that low oxygen conditions may develop at night, but vanish at day-break, and that algal blooms can pop-up in just a day or two. Standard weekly sampling completely misses these trends. Finally, we can now also begin to compare the day-by-day changes between years. It’s easy to access the data generated by the water quality buoy and the USGS gage, just go to the FOGP website (www.friendsofgeorgicapond.org) and click on the real-time data button at the center of the homepage screen. You can get a historical overview of water levels or check on the water level in just the last few days, and find out how salty or what the temperature of the pond is. You’ll have to convert from Celsius to Fahrenheit.